I JUST DOWNLOADED THIS ON MY IPHONE! 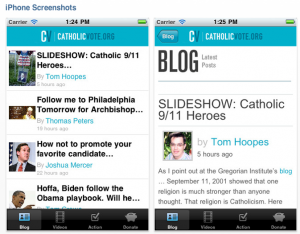 SOUTH BEND, Indiana, SEPT. 28, 2011 (Zenit.org).- The company that put confession preparation on the iPhone now has a tool for Catholic voters: CatholicVote Mobile, aimed to mobilize and unify those who want to get the Church’s view to Congress. Little i Apps, LLC, makers of Confession: A Roman Catholic App, collaborated with CatholicVote.org in the development of the new app. The service provides a method to contact members of Congress, as well as offering mobile access to CatholicVote.org’s blogs and news. A one-touch method allows Catholic voters to more easily participate in the political forum. Based on a user’s GPS location or zip code, the app generates the contact information for their representative and senators. Users can select to automatically add this information to their contact lists or simply tap to connect. 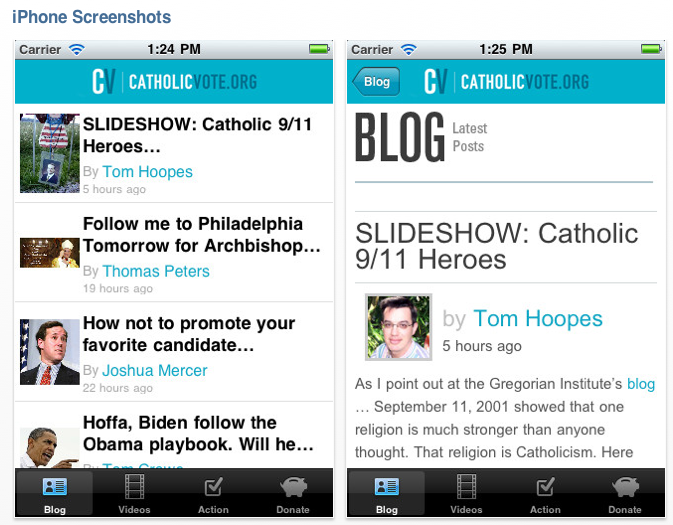 CatholicVote Mobile is free and is available on the Android Market and the iTunes Store. We need some Apps like these for us Android users!